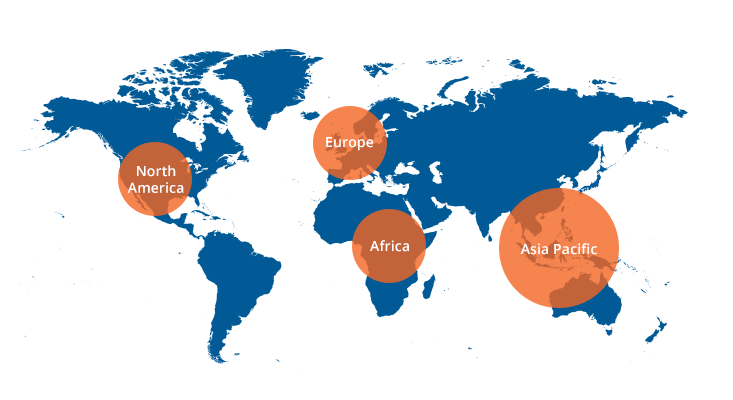 We operate in Asia Pacific, Europe, North America and Africa to serve our worldwide customers. Built to provide value, quality and cost-effective solutions to our customers, the Azeus Global Delivery Model (GDM) has been running successfully for nearly two decades. Our offshore development centres in Manila and Dalian offices are tightly integrated into our software development processes appraised at CMMI Level 5. The model enables us to maintain competitive pricing for our clients without compromising the quality of our services. Established in 1991 as the first Azeus office, Azeus Hong Kong is the centre responsible for providing a wide range of IT consultancy and applications development, maintenance and support services, as well as business process outsourcing, by leveraging the offshore development centres in the Philippines and Mainland China (Dalian). Established in 2015, our office in Sydney, Australia mainly serves for the sales and promotion of our paperless meeting app Azeus Convene to Australia and New Zealand. It is also responsible for providing software applications and services to clients in these countries. Established in 2016, our Malaysia office specializes in the promotion and sales of our paperless meeting app Azeus Convene to Malaysia. Established in 1994, the Manila office is a centre focusing on systems development. Since its establishment, it has successfully handled over 200 projects in the last 25 years. The development model of the centre is tightly integrated into our software development processes, with proven effectiveness and quality adopting CMMI Level 5 procedures. In 2007, Azeus expanded its Philippine operations with its second offshore development centre in Cebu City. Established in 2003, the Dalian office serves as an offshore development centre. Assessed at the highest level, Level 5, under CMMI, it is responsible for providing a wide range of IT applications development services. Azeus has expanded its businesses to the United Kingdom, where it set up its first UK office in London in 2010. Our UK operation not only promotes and delivers software applications, mobile apps and services to customers in the UK but also in Europe. Azeus UK is fully supported by the Azeus offshore development centres to offer a cost-competitive but high quality model. In North America we focus in the promotion and sales of our paperless meeting app Azeus Convene. We also have partner in North America for joint business development with a view to delivering software applications and services to clients in the United States, leveraging on Azeus’ well-established track records in other countries. We have consultants, representatives and partners in South Africa and Kenya who focus in the promotion and sales of our paperless meeting app Azeus Convene to customers in Africa.